Getting fit for your surf trip! If you’re planning that surf trip you’ve been waiting for all year and you not lucky enough to surf as much as you’d like then you may want to consider some surf fitness training!? Even one session a week of surf specific land based training can be highly beneficial to your surf holiday, boosting your wave count, keeping you out longer in the water and enhancing your surfing performance. If you’re not lucky enough to surf on regular basics then there could well be some sore shoulders after the first day of your trip which could only get sorer as the trip goes on! In addition to sore shoulders, back, arms ECT act... there’s going to be a demand on your aerobic fitness. Surfing is a highly demanding sport on the body, paddling for waves, duck diving, paddling out through even 3 foot waves can leave you breathless, and there’s also the non stop popping up that goes on. Boosting you upper body strength, core body strength and leg power is a must for helping you to enjoy your surfing experience to the full. If you’re new to exercise or you have underlining back, knee, or shoulder injuries then you may want to consult your doctor or seek professional fitness advice. If you’re keen to boost your upper-body strength and paddle power the list of ways are endless, from resistance training to own body exercises the list is endless. One of the most effective way to boost your paddle power is by resistance training either in the form of stretch cords or free weights. The beauty of stretch cords is you can take them any where even on your surf trip! There light portable and can really boost your wave count! 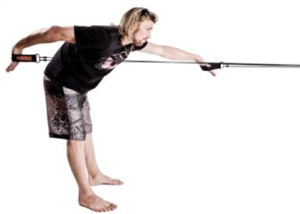 The PowerStroke cord is a surfing resistance training kit that will do just that! It comes with 2 interchangeable cords and a draw string bag so it’s totally portable! Take it to work, use it at home, and pack it in your bag and its there to grab a quick paddle workout any time anywhere, the PowerStroke cords also come with an instructional DVD. Use the power-stroke cords 2/3 times a week and it really makes a difference to your surf fitness, even a mere 15/20 minute workout will boost your paddle power! In addition to resistance training there are many other types of training available to the surfer wishing to get ahead in the water one of which is Swiss ball training, over the years this simple but effective way of training has also found its way into the surfing world. 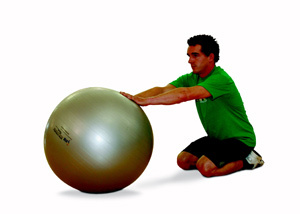 Boost your surf fitness with Swiss ball training! From core training to free weights workouts the list is endless; the Swiss ball can also be used for post surf flexibility sessions, balance training, and is a cheap bit of kit to buy! For more info on Swiss ball training go to www.fit2surf.com , Swiss balls are available to buy and can be a great asset to any surfer! Get to the pool and swim! Regular swimming training has to be one of the best ways there is to get you fit to surf, upper body movements and fitness demands on the body are very similar. During surfing paddling movements the shoulders, back and triceps all work to power you along this is also the case during swimming, although speed in swimming is largely governed by good technique, they are very similar. In fact the aerobic fitness gained from swimming, will help you during paddle outs, hold downs, wipe-outs, and paddling for waves. Providing you get to the pool about 2-3 times a week and you can swim front crawl with an ok technique you will find that with in just a few weeks there’s a big difference in your surfing fitness. To make a significant improvement in your swimming fitness then at least 40 -60 minutes of front crawl swimming is important. 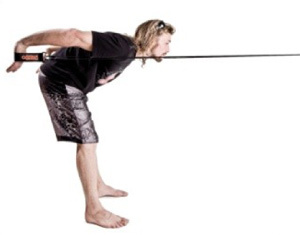 The ultimate surf training Aid! THE BOSU! In addition to the Swiss ball there’s the ultimate surf training piece of kit, the BOSU meaning both sides up can be used on both sides to train on, this means that the type of training you do on it can be endless! The BOSU plays a major rolling in the strength and fitness training of 2 of the uks top pros-Oli Adams Ben skinner both who use the BOSU on Regular Basics to boost the surf strength and performance. 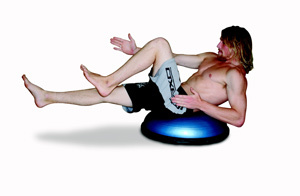 To get your hands on a BOSU or any other balance training kit like the indo board or cool board also go to www.fit2surf.com with stacks of free advice on usage and training.